Holmium (pronounced /ˈhoʊlmiəm/) is a chemical element with the symbol Ho and atomic number 67. 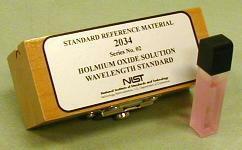 Part of the lanthanide series, holmium is a relatively soft and malleable silvery-white metallic element, which is stable in dry air at room temperature. A rare earth metal, it is found in the minerals monazite and gadolinite. Holmium Facts for Kids. Kiddle Encyclopedia.